On 23 June 2016 the voters of Britain will have an opportunity to vote in a referendum on whether to leave or to stay in the European Union. Amongst all this fiddling around with that most un-British of procedures, a referendum, the British should spare a thought for the poor Swiss, those masters of direct democracy and referendums, a minority of whom drag themselves out on Sundays four times a year to vote on bundles of proposals. On 28 February this year the Swiss people will be asked to vote on a proposal to implement the result of a previous referendum they accepted five years previously. You may need to read that last sentence a few times. All those years ago, in November 2010, Swiss voters dragged themselves out to approve with a solid majority a proposal to force the deportation of foreigners convicted of serious crimes. The initiative was borne on a flood of popular anger at growing lawlessness in the country. The problem is not imaginary: the crime statistics lend credence to the feelings of insecurity and there is plenty of anecdotal evidence that fuels it, even in the generally deferent Swiss media. A recent case concerned a very unpleasant foreign criminal who, while the legal cogs were grinding, hooked up with a Swiss girl and produced babies. The Swiss deported him, but then had to accept him back shortly afterwards and even to pay him compensation for violating his human rights. Swiss people have long shared a perception of their country as orderly and law-abiding. This no longer seems to be the case. Even when foreign criminals are caught it is often said that they find the humane Swiss prisons the equivalent of four star hotels in their own countries. The referendum proposal accepted, its supporters went back to their lives thinking that was the end of the matter. How wrong they were. The acceptance by the voters of that proposal was a political timebomb. The powers that be in Switzerland – the members of the classe politique – were appalled. This result, the clearly expressed will of the people, could not be implemented without blowing a hole in process law and the complex network of human rights treaties to which Switzerland had signed up over the years. What about criminals with families? Criminals who might be tortured or executed in their own country? Criminals who might not be accepted back by their own country? In short, could the simple will of the simple people be allowed to override the clever complexities of the modern state? This ticking bomb sat in the offices of the classe politique for two years before anyone even dared to touch it. It finally ended up in the Swiss Parliament, which with trembling fingers attempted to defuse it. Yes, criminal foreigners could (theoretically) be deported but the final decision lay with the judges, the very members of the human-rights business whose backbones the simple people had tried to stiffen. In response, the initiators of the original referendum started collecting the 100,000 signatures they required to launch another referendum, this time to force the classe politique to implement correctly and fully the will of the people as expressed in the original referendum. They collected their signatures – nearly 150,000 in the end – within a record short time: just five months. So now the Swiss can have another shot at direct democracy at the end of this month. The supporters of the initiative have a single clear argument: what the people wants, the people should get. There are subsidiary arguments, but the argument is fundamentally one of principle: what's the point of voting when the decision can be ignored? 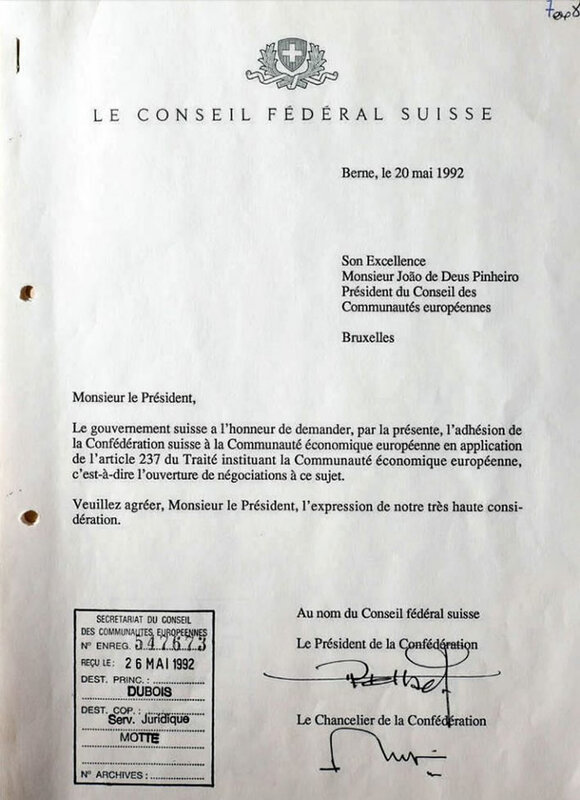 One of the reasons the Swiss rejected membership of the proto-EU in 1992 was that it was clear to everyone that their new European masters would ignore Swiss referendum democracy: in the EU the people ultimately have nothing to say. Despite that rejection the Swiss government handed in an application to join the EU anyway, an application that has been on the table ever since. The opponents' arguments are mandarin in their complexity but reduce ultimately to the idea that Switzerland is a Rechtsstaat, a state constituted on law, so we can't have the rubes interfering directly with those laws, however democratically they do it. Some suggest that issues that are irreconcilable with existing laws should not even be allowed to be put to a referendum. Particularly worrying to the opponents of the proposal is the idea of automatic punishments that restrict the power of judges to sentence in each case according to the circumstances. Law, they say, is not a matter for the direct democracy ballot box. Well, yes, all that is interesting, but for the members of the classe politique/juridique to assert it in these terms of bland Panglossian obviousness shows that they do not comprehend the real problem. They may be satisfied with their ever so rational, ever so humane and ever so legal treatment of foreign criminals, but the simple people are not. The pleadings of 120 law professors, the dyspeptic rumblings of the Neue Zürcher Zeitung, the Swiss 'Thunderer', seem to count for little: in the polls so far the supporters have had a clear lead. The Swiss simpletons are not alone. It seems that simple people in the USA appear to like Trump and Sanders, however irrational these two may sound to the ruling class there; the simple people in Germany are starting more and more to like PEGIDA and the AfD; the simple people in Britain grumble in their hatred of the establishment but don't seem to be able to do much about it. At least the Swiss bumpkins now have a chance to decide whether their establishment can just ignore them when necessary. 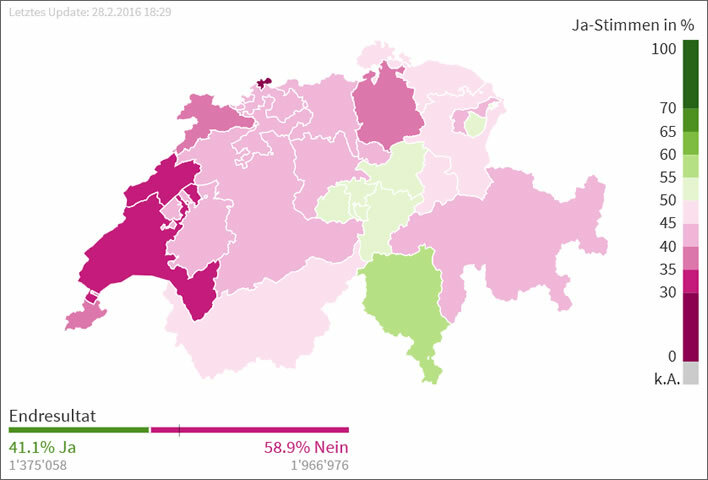 On the evening of 28 February – those experienced vote-counters the Swiss don't hang around – we will know what the simple people of Switzerland think about this. A large turnout of 63.4% of the electorate on Sunday to vote on the 'Implementation inititive' – The fourth highest turnout ever achieved in a national referendum. 41.1% supported the initiative, but 58.9% rejected it (rounded 40:60). Referendum results by canton. Switzerland is a very divided country. The opponents' victory does not indicate a trend. Were there to be a worsening in the asylum situation the proponents could gain support again. Broad-brush, emotional, detail-free argumentation is effective. According to a large online survey of referendum voters, one single political lie was responsible for the massive reaction of young voters that led to the rejection of the Implementation Initiative, 'DSI'. In a television programme, an opponent of the DSI initiative had asserted that, if the initiative were to be accepted, a foreigner who had lived all of his or her life in Switzerland and who stole an apple from a neighbour's garden would have to be deported. A spokesman for the proponents of the DSI initiative said that they had never managed to rebut this assertion: 'It was repeated penetratingly again and again and survived stubbornly'. The differences between the age groups in the survey were 'immense'. According to the study, young people (18-34) were able to relate to the stolen apple imagery to a much greater degree than the older age groups. Young people, particularly in the urban conglomerations, had immigrant friends as schoolfellows and work colleagues. They could easily imagine what obligatory deportation without any consideration of an individual's personal circumstances might look like, even though the DSI initiative was only proposing this for serious crimes. Older voters were much more moved by more abstract arguments, such as the protection of the victim rather than the criminal and the need to accept the will of the people as it had been expressed in the initial referendum. A single, emotionally-charged, easily-visualised, practical example can carry the day – even if it is a lie. Such an example can be so powerful that it can never be countered by rational argument. The political 'rapid-response' units have a place here, but it seems that a single, powerful image is almost indestructable. 24 years after its submission the Swiss application to join the EEC/EU has finally been formally withdrawn(in German). Political reality wins.